We previously discussed sessions, which are containers for processes and other objects related to a user's logon session. Among those other objects are window stations, which act as security boundaries for processes and desktops. If you're not already familiar with these objects, see Sessions, Desktops, and Window Stations (Technet) or Window Stations and Desktops (MSDN). From a forensic standpoint, by analyzing window stations objects, you can detect applications snooping on clipboard activity along with the frequency of clipboard usage and the available data formats. 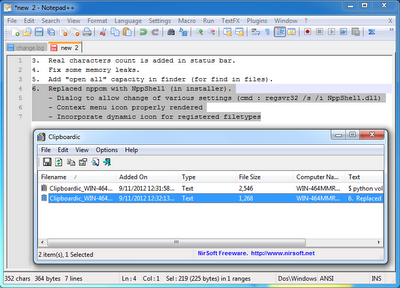 Notice the clipboard base is NULL, there are no formats, no clipboard owners or viewers, and the serial number is zero. We can use the wintree plugin (see a future MoVP post) to grep for the initial windows of the class CLIPBRDWNDCLASS. More information on the wndscan plugin and its usages in forensic investigations will be presented at Open Memory Forensics Workshop (OMFW) 2012. Thanks for this blog entry - dug it up to help define my attack model for my password management research. Trying to understand how prevalent clipboard monitoring is and how might it be relevant to vulnerabilities associated with software-based password management solutions like KeePass.